Historical file photo of Ensign Jesse L. Brown, seated in the cockpit of an F4U-4 Corsair Fighter plane, the U.S. Navy’s first black naval aviator. Ensign Brown flew with the “Swordsmen” of Fighter Squadron Three Two (VF-32) aboard the aircraft carrier USS Leyte (CV 32) during the Korean Conflict. While in Korea, he was killed in action and posthumously awarded the Distinguished Flying Cross. Jesse LeRoy Brown was born in 1926 to a schoolteacher and a warehouse laborer in Hattiesburg, Mississippi. Suffering through the ravages of the Great Depression like millions of other Americans, the Browns were forced to move within Mississippi a few times to find suitable work to provide for the family of eight overall. The Browns instilled a deep sense of discipline and commitment to excellence in their children, ensuring that they were in church on Sundays without fail and never missed a day of school. These qualities manifested themselves especially in Jesse, who was thought of by his peers as a very serious, intelligent and friendly kid who had absolutely no airs about himself and worked hard. Jesse gained his love of aviation from attending an airshow with his father at a very young age. This interest in flight was cemented by his devotion to reading flying magazines and hanging around a nearby airfield in his youth. Brown attended a segregated high school, graduating with honors and having made appearances for a number of his school’s sports teams. Brown, headstrong and determined as ever, forwent enrolling in an all-black college for his undergraduate education and joined The Ohio State University as a freshman, something his hero Jesse Owens had done less than a decade earlier. Taking on a number of jobs to pay for his education, Brown finally saved up enough to cover his tuition and attended OSU, majoring in architectural engineering after being excluded from the aviation program due to his race. He worked from the time classes ended to midnight to pay for his education and board, never once dropping below the top spot in his class grade rank. In his sophomore year, an opportunity in the form of the US Navy’s Aviation Cadet Training Program presented itself to Jesse, granting him the chance to accomplish his dream of becoming a pilot. 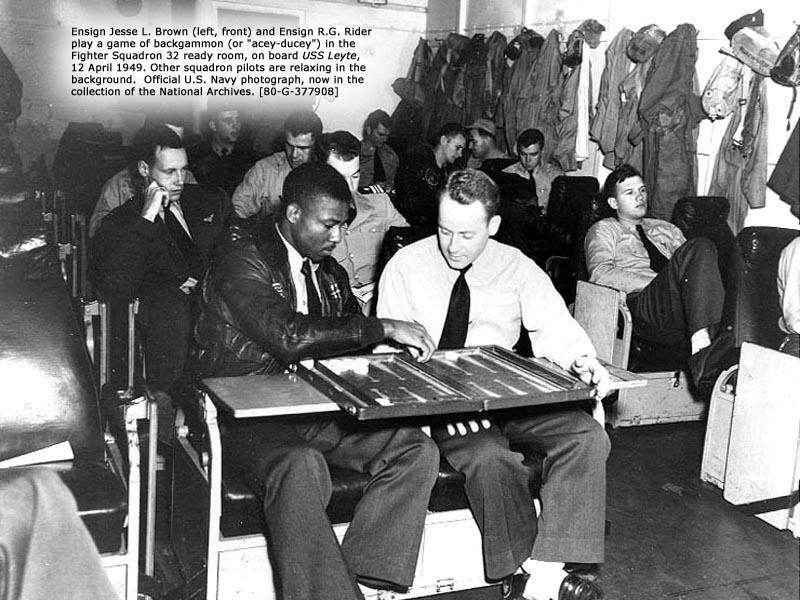 Even with recruiters hindering his efforts because of his race, Brown passed all examinations and was enlisted into the Naval Reserve in 1946, becoming a member of OSU’s Naval Reserve Officer Training Corps (NROTC). He finished his degree the following year, the pay provided by the Navy allowing him to leave his jobs and focus completely on his education. According to Morris J. Macgregor Jr. in his study, Integration of the Armed Forces 1940-1965, there were only 14 African Americans out of a total 5,600 NROTC candidates at the time of Brown’s graduation. Having finished his degree, Brown reported to Illinois for training, officially becoming a midshipman in the Navy. 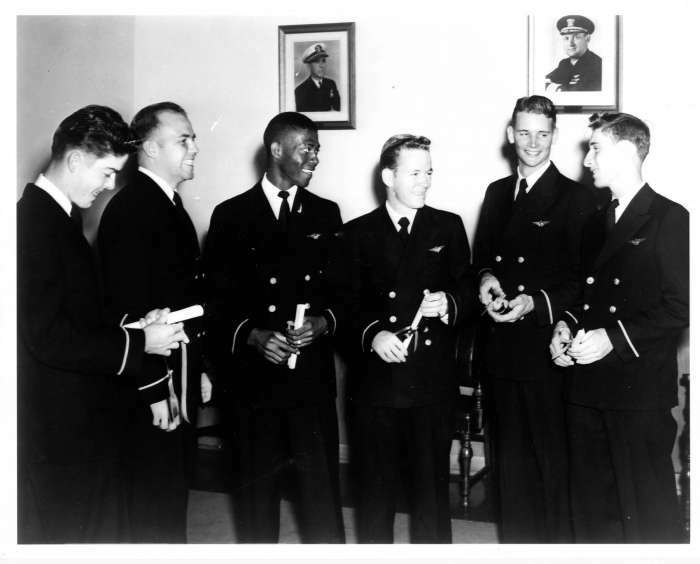 Though he expected the usual racial bias and antagonism he received most other places, his fellow midshipmen and Naval Flight Officer trainees were quite friendly and warm towards him. Brown, motivated by the encouragement of his instructors, reached Pensacola, Florida and graduated training in August of 1947; he married his sweetheart, Daisy, that same year. In 1948, Brown qualified as a naval aviator, earning his Wings of Gold after achieving positive sores on trial landings and takeoffs aboard the USS Wright (CVL-49). 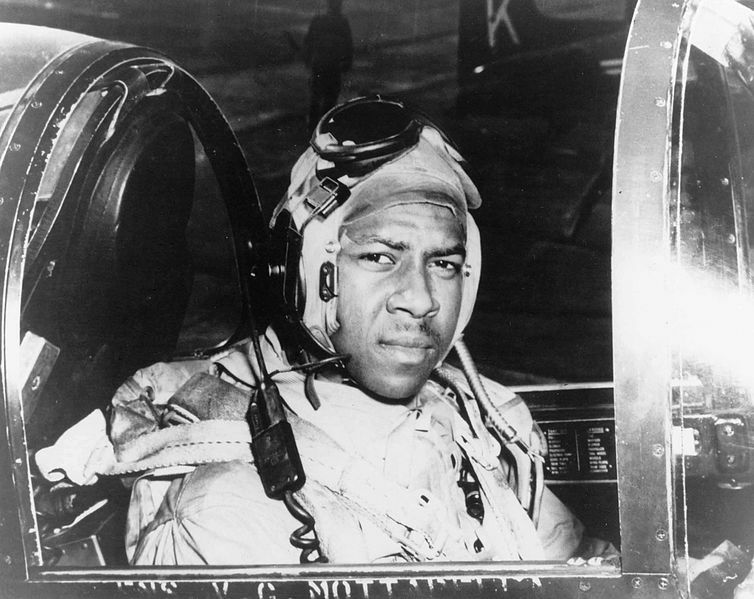 It was then that Brown received national attention for his dogged determination in breaking the color barrier in aviation, becoming the first African American naval aviator in Navy history after being commissioned an Ensign in 1949. Having qualified on both the Vought F4U-4 Corsair and the Grumman F6F Hellcat, Brown especially distinguished himself in training exercises thereafter, gaining a reputation among his fellow aviators as a highly competent and well-liked fighter pilot. By 1950, the Korean War began in full-force and the USS Leyte (CV-32) was sent forth as part of Task Force 77 to join the war effort. By this time, Brown was assigned to VF-32, The Fighting Swordsmen, aboard the Leyte. He flew numerous missions from the deck of the Leyte in support of troops on the ground, especially during the Battle of Chosin Reservoir. On the afternoon of the 4th of December, 1950, Brown took off in his F4U Corsair with five other fighters on a close air support mission with the intention of providing aerial cover for Marines surrounded by Chinese forces. The flight was allocated three hours to attack assigned targets and reconnoiter Chinese ground positions in the area of operation. After a little over an hour into the mission, one of the pilots of the flight radioed in that Brown’s aircraft was leaking fuel, probably after taking fire from Chinese troops on the ground. The Corsair became increasing unstable and in an effort to land the doomed fighter, Brown jettisoned all external cargo and swooped in for what he hoped would be a relatively soft landing on a snow-covered face of a mountain. However, the aircraft overshot and crashed, breaking up upon impact and trapping Brown in the wreckage. He was nearly 15 miles behind Chinese military lines in the bitter cold, seriously wounded with the remains of his aircraft catching on fire. At first, his comrades in the air felt that Brown was deceased but it soon became evident that he was alive through his attempts to extricate his pinned leg from underneath the wreck of the fallen Corsair. They began flying defensively around the site, ready to destroy any would-be attackers on the ground or in the air. In what can only be describe as sheer bravery, Brown’s wingman, Lt(jg) Thomas Hudner crash-landed his Corsair nearby and ran to Brown and tried to pull him free from the wreck but was still unable to do so. For nearly 45 minutes, Hudner, assisted by the crew of a rescue helicopter which had arrived on the orders of the flight lead, worked tirelessly to put out the fires and free the fallen aviator but were unable to do so before the helicopter had to return to base. Brown passed away after losing consciousness, his last words being “Tell Daisy I love her.” Hudner repeatedly requested his commanding officers for permission to return to the site of the crash to remove Brown but was denied time and time again due to the location of the crash deep in enemy territory. Unwilling to let the body of the celebrated pilot nor his plane get into enemy hands where Brown’s remains would most probably be desecrated, US Navy pilots dropped napalm on the area. Hudner was later awarded the Medal of Honor for his valiant attempt to rescue his comrade and friend. Brown was honored for his service with the Distinguished Flying Cross. He was an inspiration to numerous African Americans, a few of whom would also be firsts in their own right. Take LtGen Frank Petersen Jr., the Marine Corps’ first African American aviator and its first African American general officer. It’s rather fitting that we start off our first Black History Month at Milaviate.com with a tribute to the first African American naval aviator in service of the United States Navy.